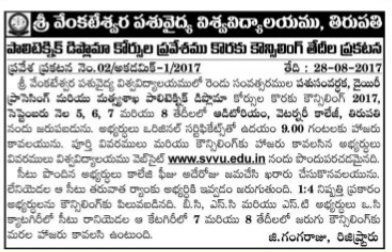 SVVU Polytechnic Two Year Diploma courses Admissions Counselling Dates 2017: Polytechnic Diploma courses Counselling dates for for Admission in to A.H/Fisheries/Dairy Processing Polytechnic Two Year Diploma courses for 2017-18. Animal Husbandry course admissions Counselling dates, Fisheries and Dairy Processing course admissions counselling dates. Sri Venkateswar Veterinary University(SVVU) issued the polytechnic admission notification 2017 for Admission into two years Animal Husbandry , Fisheries and Dairy Processing polytechnic Diploma courses for the academic year 2017-18 and the Veterinary University invited applications from the eligible candidates in the prescribed proforma for admission into A.H. Fishery, Dairy Processing Polytechnic Two Year Diploma courses courses. Now, AP Veterinary University has announced Counselling dates for Admission in to A.H/ Fisheries/ Dairy Processing Polytechnic Two Year Diploma courses for 2017-18. The Polytechnic Two Year Diploma courses Admissions Counselling would be conducted from September 5th to 8th at Auditorium, Veterinary College, Thirupathi. Eligible candidates should attend the counselling with original certificates by 9.00 AM.